Are you ready to be a yoga teacher and open your self to help more people be part of the yoga community? 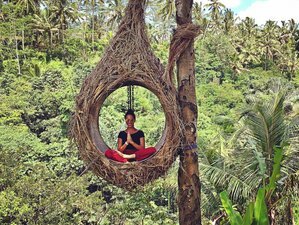 Your journey of yoga can start on this Bali yoga teacher training with YogaUnion on their eighth year organizing this course. Get your knowledge, confidence, and skills to increase by training under a highly-experienced team of specialists and see yourself turn into a yoga expert! From day one, you will start building your lessons. Gustis Garden 2 Ubud, Nirwa Karma Ubud Purnama home and Restu House & Spa are carefully selected as YogaUnion's. Official partners in accommodating and hosting students of YogaUnion training courses and retreats. Upon completion of this yoga teacher training, students will receive a certificate affiliated with Yoga Alliance Professionals. Registration with Yoga Alliance Professionals provides a globally recognized credential. YogaUnion prepares you to become a yoga teacher through an internationally accredited teaching yoga certification program with Yoga Alliance Professionals based on Vinyasa Flow. The primary aim of this yoga teacher certification course is to make a new generation of yoga instructors with a profound knowledge of Vinyasa yoga and the yogi way of living through a deeper understanding of their own practice and their own body. The teachers are always present in your practice just observing and suggesting you the necessary corrections, variations, or improvements. Once a week, there will also be posture clinic lessons to make sure that you practice with correct techniques and alignment so that when you leave the course, you have advanced your practice to a much higher level than you came with and can apply the theoretical knowledge in your own practice. The themed workshops will cover a wide range of asana keys like handstands, back-bends, inversions, and hip openers. Twice per week, the trainees will meet one of these aspects through more advanced asanas and demanding postures as well as the way of working towards them. You will start to teach from day one. The building of the yoga lessons will be gradual and smooth, facilitating everyone to develop their talents. Teaching will also be progressive, starting with one-to-one lessons in the beginning and moving step by step to bigger groups of students ending up in full open classes. This will include both human physical anatomy and physiology (bodily systems, organs, etc.) and energy anatomy and physiology (chakras, nadis, etc.). This also includes both the study of the subject and application of its principles to yoga practice (benefits, contraindications, healthy movement patterns, etc.). You will also learn practical anatomy with a major emphasis on muscular and skeletal structures and in-depth study of anatomical and skeletal differences. For example: compression, tension, and proportion and orientation theory. The hotels are located just outside of the busy center of Ubud, in a peaceful, magical sanctuary, beautifully nestled among the rice fields and lush jungle. They are designed in a fusion between contemporary and authentic Balinese architecture and aesthetics. During your stay, you will get free Wi-Fi, hot water, private toilets, Campuhan Hill view, daily cleaning service, mosquito net, safe and towels. The hotels are embedded in lush vegetation, overlooking the steep sunset valley on one side and the open rice paddies on the other side. Special food requirements such as vegan or gluten-free diet can be accommodated. Free filtered drinking water is available in the Prashanti restaurant all day long. If you have special dietary requirements, it's a good idea to communicate it to the YogaUnion when making a reservation. Sundays are completely free, allowing for exciting day trips into the stunning tropical nature. It will be an amazing opportunity to be part of life in Bali. The great island of Bali offers a variety of breath-taking excursions. Bali is located just south of the equator, and is one of the 17000 islands of Indonesia. It features lush tropical vegetation, big volcano mountains, and countless beaches with big waves and coral reefs. You can enjoy surfing in the famous waves of Bali. Other popular beach activities include stand-up paddling, snorkeling, diving, or just enjoying your free time in the sun. The nearby mountains invite for a sunrise volcano tour, hikes to paradise waterfalls, downhill biking, as well as visits to tropical jungle farms, producing cacao, vanilla, coffee, mangoes, and much more. Ubud is famous for its artistic wood carving and stone work, featuring picturesque temples, art and fashion galleries, colorful markets and exclusive health food dining, as well as stylish spa resorts with tropical swimming pools to unwind. An all-time favorite is the downtown monkey forest with giant trees, temples, and countless free monkeys. In Bali, you will have the best massage of your life. Please let YogaUnion team organize that for you, just ask. Learn yoga philosophy and Meditation. Cars have to stop before the rice field path on the way to our premises, which is accessible by foot or scooter/motorcycle. If you have booked a taxi with us, the driver will help you with everything. That long rice field path/road is the main street in our area and all the student’s bungalows, our Shala and the restaurant are there. YogaUnion neighbourhood is peaceful and serene so a respectful attitude is asked of you.